Look closer at this masterpiece and you'll see an entirely new kind of opera, one which rails against the societal conventions its composer loathed. At a time when other Russian composers were preoccupied with grand, public opera plots that drew from Russian history and mythology, Tchaikovsky took the risk of moving in the opposite direction – into the intimate, private world of Eugene Onegin. As a true Romantic, Tchaikovsky believed in the primacy of the inner world over the glittering public world of the Russian Imperial Court. Outwardly, he embraced this life, but in his diaries he distanced himself from it. Perhaps this is why his glittering waltzes and marches can often seem hostile to the personal lyrical core of his works – they represent a world whose attractions threatened to undermine his artistic calling. For a section of the audience in Tchaikovsky’s time, ballet was the highlight of any opera: no singing, no plot to follow, just easy-going music, and – most importantly of course – scantily-clad young dancers. Tchaikovsky seems to comply in Onegin, providing not one, but two ball scenes. But on closer inspection, each is problematic, and Tchaikovsky refuses to take the convention for granted. The first ball, for example, is not at all a glamorous occasion, but a tawdry rural knees-up populated by coarse landowners and their spiteful wives. The pretty and undemanding music acts as a foil for malicious gossip, and the three leading characters are oppressed by it, leading to the fateful argument between Onegin and Lensky. The corruption of the public world destroys their tender friendship, and the duel that follows destroys Lensky himself. Tchaikovsky shaped Onegin’s public scenes so that a perceptive audience could see the alienation of the leading characters from the outside world. Their inner life unfolds instead in domestic spaces and intimate settings. But even here, away from the public eye, out of earshot of the gossip-mongers, life is still circumscribed by social convention. Even Tatyana’s burning infatuation is revealed to us in wild flashes between stretches of well-behaved music. After a night of passionate longing, she has to get up, get dressed and face the world. The social fabric of the story is woven into the music: the heroes do not converse and exchange arias in the style of grand opera, but instead follow the style of the Russian romance – the modest parlour song that Pushkin would have recognized in the 1820s. Accordingly, the opera’s musical forms are quite simple, with a main section, contrasting middle section and reprise, or else merely strophic (repeating the music with every new verse). Tchaikovsky also avoids coloratura and other virtuoso devices – all the high notes come from the heart. But while the romance style allows Tchaikovsky to create a simpler, more sincere form of expression, it also imposes its own stylistic constraints. The repetitions of the romance form places the passions of Tatyana, Onegin and Lensky within a conventional frame – not because Tchaikovsky was unable to create freer forms, but to reflect the convention-bound position of the characters. He was not pointlessly swapping one set of conventions for another: Tchaikovsky can use the romance to reflect the conventions of the world in which Pushkin’s characters lived. Although he had created a radically new kind of opera in Eugene Onegin, Tchaikovsky was slow to see that it had any further potential. Instead, he was consumed by doubt: did Onegin even deserve to be called an opera? Was it fit for the grand stage? But today, the music’s psychological power continues to win new audiences for this story of love and life. This is an edited extract from Marina Frolova-Walker’s article ‘Intimate Truths’ in The Royal Opera’s programme book, available during performances and from the ROH Shop. 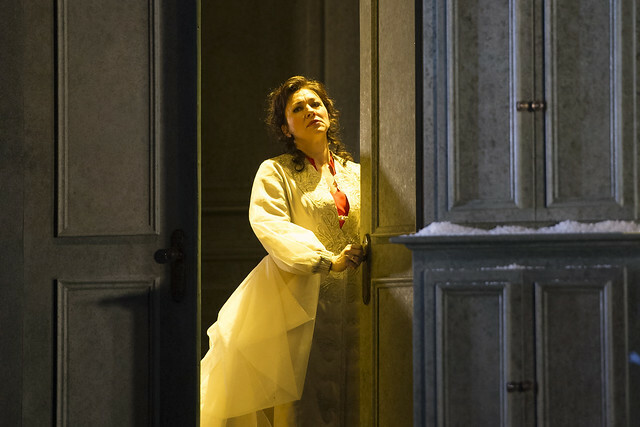 Eugene Onegin runs 19 December 2015–7 January 2016. Tickets are still available. The production is a co-production with Teatro Regio di Torino and Opera Australia, and is given with generous philanthropic support from the Danish Research Foundation.